Volumes 1-4 now available on Document CD. Informative booklet notes by Tony Russell. Bill Chitwood and Bud Landress, with their friends Phil Reeve, Ernest Moody and Clyde Evans, and associates such as Andrew and Jim Baxter, the Harper brothers, Gus Boaz, Lawrence Neal and others, would represent and promote the musical culture of their region for most of a decade. Thanks to them, Gordon County, Georgia, has come to be held in high regard by lovers of old-time Southern music. Today we can see it as a prism, its facets reflecting the different forms of Southern music: old-time fiddling, quartet singing, stringband ensembles, rustic comedy, yodelling, blues. No doubt many other counties in the South offered a similar diversity of music. What makes Gordon County special is that so much of it was permanently documented on phonograph records. Between 1924 and 1931, Gordon Countians created 104 issued recordings. These roused great interest among their fellow citizens and were frequently written about in the local press. Together, the recordings and the reports constitute a legacy of extraordinary specificity: this was what was going on musically, at this time, in this section of northwest Georgia, and this is what the people who lived there thought about it. Aided by this collection (and the music of the Baxters, available elsewhere on Document), we can hold a magnifying glass over a map of Gordon County, so that towns and communities leap into large-print life. We see the streets of Calhoun and Resaca and Sugar Valley, hear the rattle of wagon wheels and the distant whistle of the railroad train, the massed voices from the singing convention in Calhoun’s City Auditorium, the strains of contesting fiddlers at the Courthouse, of the Baxters playing for picnickers at Dew’s Pond, and of Bill and Bud and their cronies serenading the townsfolk in Gentlemen’s Park. We have been working with Tony Russell, Harry Bolick and others to expand the series and we are delighted to present the first two volumes in a series of four of The Georgia Yellowhammers: Bill Chitwood and Bud Landress, with their friends Phil Reeve, Ernest Moody and Clyde Evans, and associates such as Andrew and Jim Baxter, the Harper brothers, Gus Boaz, Lawrence Neal and others, would represent and promote the musical culture of their region for most of a decade. Thanks to them, Gordon County, Georgia, has come to be held in high regard by lovers of old-time Southern music. By 1926, the success of The Skillet Lickers (another string band from Georgia in the 20’s) was proving to America’s record companies that the hard-driving North Georgia fiddle band sound could be a commercial commodity. All kinds of string bands paraded through the studios in the late 1920’s, each seeking a piece of The Skillet Lickers’ action, and many bearing wild, extravagant names such as Dr. Smith’s Champion Hoss Hair Pullers, Seven Foot Dilly & his Dill Pickles, and the West Virginia Snake Hunters. Many of these groups made a handful of records and then faded away. 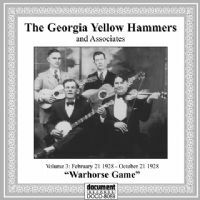 One that did not, though, was an outfit from Gordon County, Georgia, called The Georgia Yellow Hammers. Unlike many other bands, the Yellow Hammers generated a distinct style of music that was uniquely their own, and they recorded extensively & successfully. To a casual observer, the Yellow Hammers may seem merely another imitation of The Skillet Lickers. After all, both bands were from North Georgia, and both were built around a preexisting fiddle & banjo team. Both presented images of hard drinking, carefree rustics, and in both cases these images were the products of records company executives. both recorded comedy skits, as well as vocal & fiddle tunes. Both contained musicians who wanted to transcend the narrow confines of the old time string band. Both were in a sense studio groups, with personnel shifting from session to session, and both shared a common repertoire of north Georgia fiddle tunes. Yet there were some important difference too. 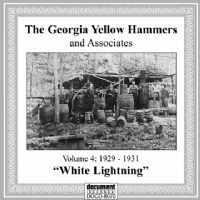 The Yellow Hammers were based not in Atlanta, but in rural Gordon County, some sixty miles to the northwest. The Yellow Hammers stressed singing more than the Skillet Lickers (their records are full of fine quartet work), and boasted among their ranks two formally trained musicians who were adept at reading and composing all sorts of music. 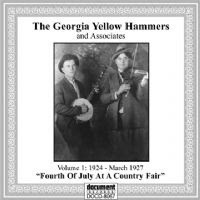 Yellow Hammers members were more ecumenical in their music, recording gospel quartets, sentimental songs, blues, pop, fiddle breakdowns, and even a couple of sacred harp tunes.